Italy's president dissolved the country's Parliament on Thursday, paving the way for a new election. Possibly a very contentious one. 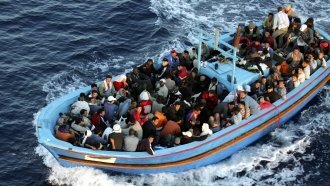 One of the biggest issues is likely going to be migrants seeking asylum in Europe, many of whom land in Italy first. Italy is normally pretty sympathetic to migrants, but recently the issue has become more and more polarizing. And, just like in other parts of Europe, that polarization has led to the rise of far-right parties in the country. Those far-right parties have been gaining ground in local elections, and they could keep up that momentum at a national level. But no one party is likely to get enough votes to form a majority government when the general election rolls around in March.